Pakistan Industry Vertical Digitization Enables Vision 2025 and Transforms Daily Lives. Digital transformation is the top priority for Pakistan’s CIOs to transform industry verticals and daily lives, the global digital transformation enabler SAP announced today at SAP NOW Pakistan, one of the country’s largest technology events. 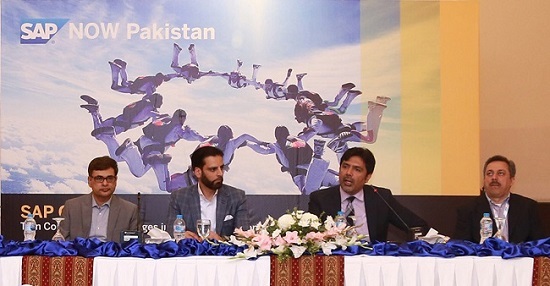 Pakistan business leaders at SAP NOW Pakistan agreed with global research that shows 84 percent of organizations rate digital transformation as critical by 2022, according to the recent landmark SAP Digital Transformation Executive Study, conducted in partnership with Oxford Economics.“Digital Leaders” are finding 23 percent higher revenue, 85 percent market share, and 80 percent profitability. However, as the survey shows only 3 percent of organizations have undergone digital transformation, Pakistan’sCIOs are accelerating digital transformation, aligned with Pakistan Vision 2025and China-Pakistan Economic Corridorgoals economic growth, smart government, and Smart Cities. “Digitization is the top priority for Pakistan’s CIOs to solve real-world challenges, from enhancing healthcare with digital patient records, to mitigating climate change by predicting floods,” said Saquib Ahmad, Managing Director, SAP Pakistan. “SAP NOW emphasizeshow emerging technologies — such as artificial intelligence and machine learning, blockchain, and the Internet of Things — canmake a major mark on Pakistan’s society. During SAP NOW Pakistan, which launched in Islamabad, and will follow in Lahore and Karachi, hundreds of C-suite executives are discussing and debating digital trends. SAP is exchanging best practices with localizing solutions for 26 industries, and is co-innovating with Pakistan’s digital leaders, including the Controller General of Accounts, Fauji Fertilizer Company, and Lucky Cement. Digital and mobile solutions in Banking and Finance are enhancing customer service with predictive analytics and targeted services. Pension funds are also digitizing for efficiency and transparency. With 45 percent of Pakistan’s population working in Agriculture,according to the Ministry of Finance, mobile connectivity is enabling digital weather reports in Urdu, and soil quality measurement. As connected education campuses advance, the Education sector is seeing strong potential for digital technologies to enable project collaboration, real-time grading, and virtual reality field trips. Across Pakistan, SAP is advancing its strategic growth plan by hiring new talent, training young talent through the SAP Academy Program, and expanding its channel partner ecosystem with major channel partners such as EY (formerly Ernst & Young), IBM, and Siemens. SAP’s Training and Development Institute is seeing strong success on its Young Professional Program, a 2-3-month-long program to support participants in SAP Associate Consultants certification and into job placement. In Karachi, 25 talents are developing their skills on SAP Hybris e-commerce, and SAP Ariba procurement and sourcing solutions. Pakistan’s entrepreneurs can also join the SAP Startup Focus Program, which brings their Big Data, predictive, or real-time data analytics innovations to market.